Metro expects that fewer riders will take the transit service due to a combination of fare increases, longer waits between trains and a shorter service day, but they say the dropoff will be a "modest" 1 to 2 percent. WASHINGTON — Metro only expects “modest ridership losses” from its plan to cut rail service at all times of day. The plan would increase the scheduled waits between trains to eight minutes at rush hour on all lines, with longer scheduled waits at other times of day. “For each of the service proposals (peak, off-peak, evening and weekends), modest ridership losses of 1 to 2 percent are projected as service headways would widen and passenger travel times would increase, in addition to the trains being more crowded,” Metro staff wrote in response to questions from Metro Board members. Despite that projection of modest losses, Metro staff suggest that the changes — which also include fare hikes for the first time in three years — will lead to more cars on the road. If all else remains the same, Metro projects a proposed 10-cent increase in parking fees would generate an additional $1 million in revenue for the fiscal year that begins in July. “However, given that additional fare increases on rail are proposed, as well as reductions in peak period service frequency, Metro estimates a net gain of ($500,000) from the proposed $0.10 increase,” read Metro documents prepared for the board’s Finance Committee. That would mean a significant number of people who drive to and park at Metro stations today would find other ways in, including simply staying in the car. Metro board members will take a deeper dive Thursday into the service cuts and fare hikes proposed by Metro General Manager Paul Wiedefeld, and how those changes would impact ridership and revenue. Their work is part of Metro’s ongoing budget process. The final budget won’t be adopted until March and riders will have the chance to comment in January and February. 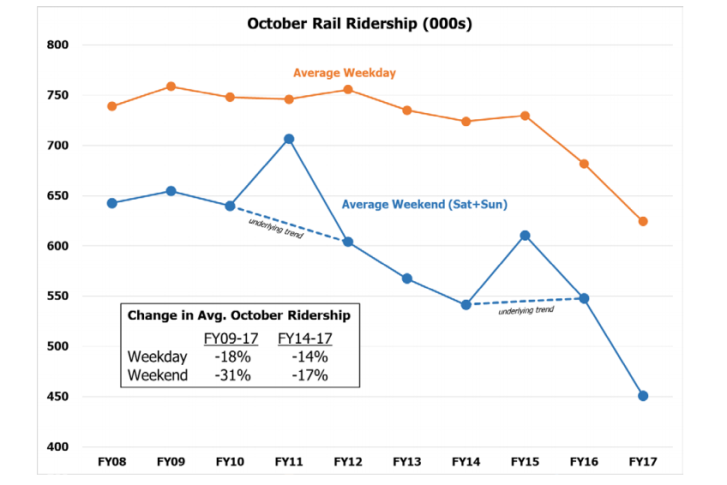 Ridership has been steadily falling for years, with a particularly sharp dropoff in weekday ridership in the two years since rider Carol Glover’s death on a Yellow Line train stuck in a smoke-filled tunnel near the L’Enfant Plaza Station. In 2009, riders took about 750,000 trips each weekday. This October, the number was 624,000. “The drop in FY2016 was primarily due to customer reaction to declining safety and service reliability. This drop has been exacerbated in FY2017 by the SafeTrack program, which has significantly interrupted weekday (including peak hour) service for many thousands of riders. Weekend ridership has also declined further (to only 450,000) as service frequency of only three trains per hour (or every 20 minutes) on most lines has become the norm,” the documents state. Weekend ridership declined sharply after track work began, creating longer and more unpredictable trips beginning after the 2009 Red Line crash. It is now down 31 percent since the 2009 peak. Metro still hopes riders will return to the system once the most disruptive scheduled track work wraps up this spring, but transit agency officials estimate that the proposed fare increases and service cuts would lead to 15 million fewer trips than riders would otherwise take. The service cuts would allow Metro to schedule additional eight-car trains if the power system can handle it. But the capacity of the power system is in question, and Metro has regularly struggled to provide enough railcars available for the current service schedule. No matter what, Metro plans to continue to schedule only six-car trains on both the Silver and Yellow lines, which share a significant amount of track with the Blue Line.